One of the first “advanced” postures I learned was Crow Pose (Bakasana). This arm balance makes me feel strong, graceful, and unstoppable. It requires almost complete full-body muscular engagement from the toes to the fingertips. It also requires a steady gaze and even steady breathing. Most of all, Crow Pose requires a strong core and a sense of fearlessness. Not only is Bakasana a full-body-engagement posture, but it also flexes the muscles of the mind because it requires a courage not usually found in adult exercises. You have to face the fear of falling flat on your face (literally). Crow Pose requires a sense of fearlessness. Even though the distance between your forehead and the mat might only be a foot or so, it is completely natural to feel a little hesitant to move forward. When you conquer that fear, you’ll feel like you’re flying on top of the world! Additionally, Crow Pose also increases upper body and core strength, and reduces upper back tightness, as well as strengthening the abdominal muscles and the Sacral Chakra. Let’s break down this asana step-by-step, so you can master this arm balance in no time! Plant your palms on the ground shoulder-width apart. Spread your fingers really wide to create an unshakable foundation. Your knees can be lower on your triceps (just above your elbows), but the closer you can get your knees toward your armpits, the more grounded you will feel. This is because you’ll be closer to your midline. A lot of people start Crow Pose by gazing at their fingers. But your body tends to follow your gaze. If you look toward your fingers, you might end up somersaulting instead of flying! Instead, shift your gaze forward on your mat about a foot in front of your fingertips. Now that your fingers, knees, and gaze are in position for Bakasana, it’s time to begin to execute the pose. Find “chaturanga arms” by bending your elbows. Keep your elbows stacked over your wrists. Feel your body weight shift into your hands and fingertips. This alone can feel very unnatural! But once you learn to trust your fingers, you can conquer any arm balance! From here, lift one foot off the ground. Engage your core and find a Cat-Pose shape in your spine. Start by hovering one heel toward your bottom. Then alternate. Once your toe taps feel comfortable, you can start getting a little hang time in the air. This might start as a fleeting second where both feet are off the ground. But eventually you will be able to hold the pose, tighten through your core, and bring your heels closer to your bottom. Tip: If you feel fear bubbling up in the space between your nose and the floor, put a blanket or a pillow on the floor in front of you! Now you can get a little creative! 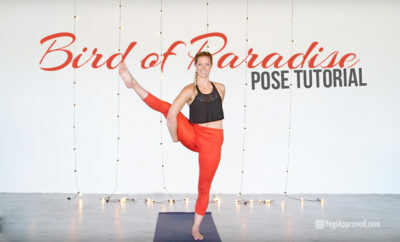 Some variations of Crow Pose include: One-Legged Crow Pose, Side Crow Pose, and Crane Pose (Crow Pose with straight arms). If you’re flirting with arm balances, Crow Pose is a great place to start! Not only is it a strong and graceful posture in and of itself, it also offers a lot of opportunity for growth with the many variations of the pose. Practicing Bakasana offers so many benefits – from stronger abdominals to a more courageous heart. So, what’s stopping you? 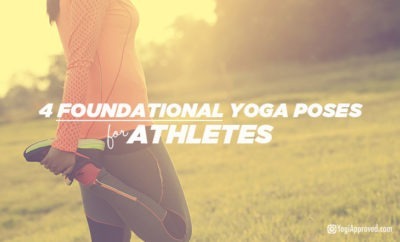 Ready to take your arm balances to the next level? Take Flight with Leah Sugerman is an 8-class yoga program that teaches 5 of the most common arm balance poses including: Crow Pose, Side Crow, Eight Angle Pose, Flying Pigeon, Flying Splits, and Grasshopper Pose. Click here and try this program free for 7-days. 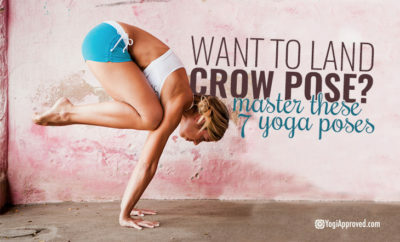 Does Crow Pose have you stumped? 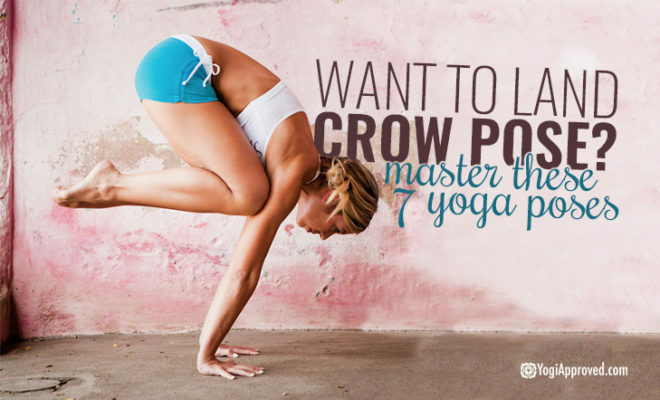 Master these 7 yoga poses first to build the strength, stamina, and balance you need before you fly into Crow Pose! Teresa is a Yoga Alliance certified yoga instructor and a Karma Kids certified kids yoga instructor. Her top passions are yoga, books, cats, and nutrition. She hopes to show that yoga is for everyone and to inspire others to find balance and self-love on their yoga and mindfulness journey. In this free video tutorial, instructor Alba Avella guides you through the ins-and-outs of nailing Crow Pose and Hurdler's Pose. Get ready to fly!